A ship at sea. A heart held captive. Can one man really change his fate? Young Walter Crofter is desperate to escape his working-class family and its bleak future. After sneaking off and joining the Merchant Marines, Walter sets sail for a new adventure — and a new destiny. He faces challenges both at sea and on land. There are pirates to fend off, trade routes to establish, and lives to change. When he meets Maria, a girl being held captive on a defeated pirate ship, he brings her aboard in an act of good will. But Walter soon discovers there may be more to his new relationship than he’d ever guessed. Can he prove himself worthy of the captive girl who holds his heart hostage? 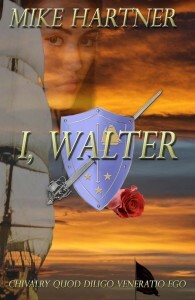 I, Walter is the first installment of the Eternity Series, a seafaring saga appropriate for teens and adults. If you like rich historical fiction, breath-taking adventure, and clean romance that makes you yearn for a happy ending, then you’ll love Mike Hartner’s standalone series starter. Buy I, Walter to start the voyage today! “I, Walter Crofter, being of sound mind…” I tossed the quill down on the parchment sitting in front of me. Bah, this is garbage! You may question my sanity but should hear the whole story before you judge me. I’m sitting here, now, at the age of 67, trying to write this down and figure out how to divvy up everything. I don’t know if I’ll ever get it right though. Too many secrets to go around. Yet, this is my last chance to tell the truth before I die. The doctors say it’s malaria, and I’ll be fine. Perhaps. However, if the malaria doesn’t indeed kill me, my guilt will first. Maybe, if you know the facts surrounding my life, you’ll understand better. I dipped the quill in the inkwell again, and wrote. Autographed copies are available through the form in the upper right. If interested in purchasing multiple copies, please contact Mike directly using the contact form above.